Afghanistan is best known in the West for turmoil, political unrest, and religious extremism. But, since 2007, Oliver Percovich and the rest of the team behind Skateistan have been bringing a different kind of extreme to the streets of Kabul. Skateistan is a non-profit outfit that teaches skateboarding to children and young adults. Conceived in Afghanistan, it is now operating in Cambodia and South Africa. 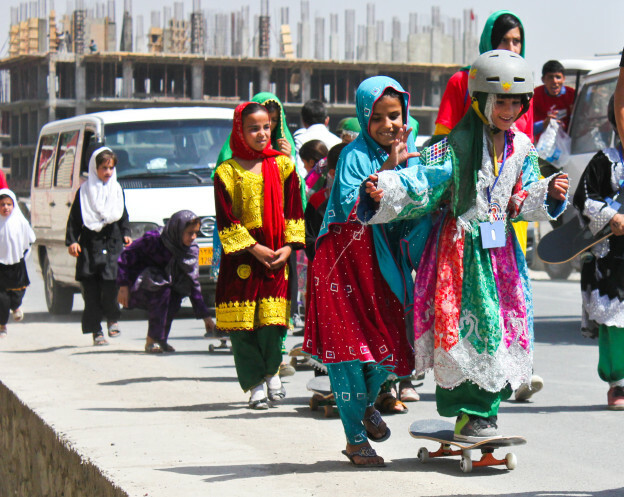 In particular Skateistan focuses on empowering girls and the poorest children in urban communities. Starting with just three spare skateboards and no formal facilities, Skateistan has grown to serve more than 500 young skateboarders in Kabul alone. The first and most popular program offered by Skateistan is ‘Skate and Create.’ Lured by the slogan ‘Come for skateboarding, and stay for education’ young skaters are given access to equipment and skate facilities, but are also engaged in creative education focusing on problem solving, human rights, environmental studies, hygiene, and more. In Afghanistan, where local and national government have placed strict prohibition on the arts and sports, Skateistan is one of the only resources that gives students, particularly young girls, access to athletic and creative outlets. The novelty of a skateboarding NGO has drawn young people to participate everywhere Skateistan has set up shop. But the aspiring skaters stay on because of the social and educational benefits the organization champions. In Cambodia Skateistan has teamed up with other local NGOs in Phnom Penh to start a community garden. In South Africa, Skateistan’s newest location, the group has rehabilitated skate facilities that had fallen into disrepair and have started offering art and music lessons along with skateboarding instruction. Skateistan has drawn the attention of skate celebrities like Tony Hawk and Holly Lyons. Both have endorsed its programs and act as ambassadors for the group around the world. With continued hard work, and the help of its dedicated staff in Afghanistan, Cambodia, and South Africa, Skateistan will totally keep rolling. This entry was posted in Blog on December 18, 2015 by agadmin.